After introduced in the Google I/O event 2016, Google Duo APK is now available for Android with the latest version 7.0.146713755.DR7_RC08. The advantages of this application compared to its competitors is security, simple look and knock features. Talk about security, Google claims that the video calling service which uses your phone number as an ID is using end-to-end encryption. This feature makes it similar to the Facetime for the same security level. 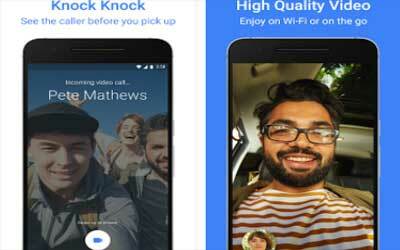 In the terms of appearance and how to use, Google Duo looks very simple. You only need to download this app, register your mobile phone number and enter the security code sent via SMS. After that, it will ready to be used. Call a friend to make video calls personally. Set the front or rear camera and video display mode by pressing the round icon at the bottom left. In addition, Duo has Knock features. This mode will display preview of the call you are doing, even before the other person receiving your call. You can show something unique so your friend will be excited to receive the call. Simple, Quick and Easy. Three words that can represent Google Duo. There is no complicated activation and no so much settings like in other applications. However, because trying to promote the simple concept, this app has fewer features than Facetime. An example is no group call mode or maybe Picture in Picture mode. This app can also run on slower Internet network. So when users can only on 2G or EDGE network, this app still run smoothly. Duo can also switch between Wi-Fi networks and mobile data automatically without disconnect the call. So far, it’s been really good. The connection is quick and the video is flawless on my Nexus 6P. I’m also using Project Fi, so I wanted to test it on the the network. again flawless video and quick connection, with no interruptions. After the couple of phone calls, it used more battery than a regular phone call which is expected. And it used about 100 MB of data total so far. So basically streaming HD video over the network, it’s on par with a HD quality youtube video. Good job!